Hitomi believes most everyone in Japan likes ice skating, hence it's expected that she go to watch "Stars on Ice". I must also go along. I do have an appreciation for the athleticism and artistry that go into the performance. Still, the performances can be cheesy. It's also uncomfortable to notice that the audience is middle-aged, overweight female women ogling hunky guys, elderly couples, and prepubescent girls dressed like princesses. 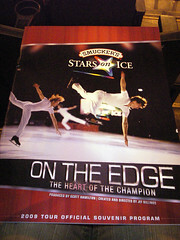 There was a pre-event tour and autograph signing by a Japanese skater, Yuka Sato. Arriving a few minutes late, we (thought) we were unable to make it. As it turned out, the signing was actually an hour late. While we waited in front of the Seattle Center fountain, somebody was looking for Hitomi and me. After returning home, we received an e-mail from the (Japanese) event coordinator apologizing that they were late. They also seemed to think I must have been Hitomi's daughter who was looking forward to meeting Yuka Sato, as they referred to me as "Elias-chan"
This entry was posted in Uncategorized and tagged ice skating, stars on ice, yuka sato. Bookmark the permalink.